A mere decade ago, Christian Zionism was seen as an emerging force in American politics. As if out of nowhere, a block of fifty to one hundred million friends of Israel were poised to enter the national debate and safeguard the U.S.-Israel relationship for generations to come. Evangelical love for Israel appeared so solid that the only debate within the Jewish community was whether or not to "accept" it. 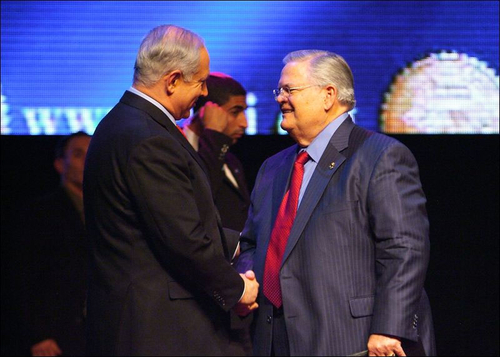 Just a few years ago, almost every significant evangelical leader, such as pro-Israel stalwart Pastor John Hagee (right), here with Prime Minister Binyamin Netanyahu, came out squarely behind the Jewish state. But now, questioning Christian support for the Jewish state is fast becoming a key way for millennials to demonstrate Christian compassion and bona fides. There is troubling precedent for such an about-face. At one time—prior to the 1967 war— the mainline Protestant denominations were among Israel's most reliable American supporters. Israel's opponents, therefore, targeted these denominations with mainline-friendly, anti-Israel messages. There are still many mainline Protestants who support Israel today. But to the extent the mainline denominations act corporately in connection with the Jewish state, it is to divest from it. And it is from Israel—not Iran—that they seek to divest. There is nothing new about the efforts to drive a wedge between America's evangelicals and Israel. Many in the anti-Israel camp have been working for years to do exactly that. Anti-Israel Palestinian Christians such as Sami Awad and Naim Ateek have traveled the country telling American Christians how their "brothers and sisters in Christ" are being oppressed by Israel's Jews. Left-leaning evangelicals such as Jim Wallis, Tony Campolo, and Serge Duss have echoed this narrative in their corner of the Christian world. Duss's sons, Brian and Matt, have worked diligently to mainstream their father's views within the fields of Christian philanthropy and Democratic Party policy-making, respectively. This situation is changing dramatically. With every passing month, more evidence is emerging that these anti-Israel Christians are succeeding in reaching beyond the evangelical left and are influencing the mainstream. In particular, they are penetrating the evangelical world at its soft underbelly: the millennial generation. These young believers (roughly ages 18 to 30) are rebelling against what they perceive as the excessive biblical literalism and political conservatism of their parents. As they strive with a renewed vigor to imitate Jesus' stand with the oppressed and downtrodden, they want to decide for themselves which party is being oppressed in the Arab-Israeli conflict. These figures may mean that evangelical support for Israel was never as universal as was commonly believed. But they may also demonstrate that years of grassroots efforts by Israel's critics were beginning to bear fruit even before their recent intensification. The year 2010 was one of dramatic escalation in the efforts to drive a wedge between American evangelicals and Israel using the medium of film. In the span of that one year, no less than three major documentaries were released attacking Christian support for Israel. These were hardly the first anti-Israel movies to be produced. What made these films special was that they were focused on discrediting Christian support for Israel. While First Run Features' Waiting for Armageddon was produced and directed by a team of secular documentarians, two other films—With God on Our Side (Rooftop Productions, 2010) and Little Town of Bethlehem (EthnoGraphic Media, 2010)—were made by Christians specifically for Christians. With God on Our Side was produced by Porter Speakman, a former Youth with a Mission (YWAM) activist while Little Town of Bethlehem was funded and produced by Mart Green, chairman of the board of trustees of Oral Roberts University and heir to the Hobby Lobby arts and crafts stores fortune. These two Christian-made films are masterpieces of deception. They feature compelling protagonists wandering earnestly through a Middle Eastern landscape in which all Arab violence, aggression, and rejectionism have been magically erased. Thus the Israeli security measures they encounter along the way—from the security fence to Israel's ongoing presence in the West Bank—are experienced as baffling persecutions, which any decent person would condemn. More recently, in November 2013, another anti-Israel documentary—The Stones Cry Out—was released. Like its 2010 predecessors, this documentary specifically tailors its anti-Israel message to a Christian audience. The film's website laments: "All too often, media coverage of the conflict in Palestine has framed it as a fight between Muslims and Jews." The not-too subtle goal of The Stones Cry Out is to reframe the conflict as a fight between Christians and Jews. The Stones Cry Out begins with the story of Kfar Biram, a Christian Arab village on Israel's border with Lebanon. Israel expelled the village's residents in 1948 in order to, in the words of the film's website, "make way for settlers in the newly created state of Israel." The film then moves on to "the expropriation of the West Bank in 1967" and the plight of modern Bethlehem, which is "hemmed in by the wall." As such language repeatedly makes clear, the filmmakers did not craft a nuanced critique of Israeli policies. They produced instead a modern passion play. It's not a hopeless case. The first time I went to the States in 1991, most of the people I met knew nothing about Palestine. That has changed a lot. I see among the evangelical Christian community more openness towards the Palestinians. The effort to delegitimize Israel on America's college campuses has quickly progressed from news item to cliché. The annual Israel apartheid weeks and the repeated divestment campaigns targeting everything from university pension funds to cafeteria humus have become all too familiar. But what many observers do not realize is that the effort to demonize Israel is also being waged on America's Christian campuses. Bethlehem Bible College in the West Bank has been a leading source of anti-Israel Christian narrative. Its "Christ at the Checkpoint" conference uses a photo of the Israeli security fence, which invokes the increasingly popular idea that Jesus was a Palestinian who would be suffering under Israeli occupation today much as he suffered under Roman occupation millennia ago. Perhaps the most troubling example comes from Wheaton College in Illinois, commonly referred to as the "evangelical Harvard." Some of the most prominent church leaders in America have graduated from Wheaton, including the Rev. Billy Graham, Sen. Dan Coats (Republican, Indiana), and George W. Bush's former speechwriter Michael Gerson. Wheaton is also the home of Gary Burge, one of America's most prominent anti-Israel evangelicals. Burge travels the country and the world accusing the Jewish state of the worst of crimes and engaging in a mockery of Judaism that borders on anti-Semitism. When Christians United for Israel (CUFI) announced plans to hold an event at Wheaton in January 2009, Burge went on the offensive. CUFI's student members came under such intense pressure that they moved their event off-campus: There would be no pro-Israel event at the evangelical Harvard. Another of America's leading Christian schools, Oral Roberts University (ORU), has deep conservative Christian roots. Oral Roberts himself was a Pentecostal televangelist and a strong friend of Israel. Some of the leading preachers in America graduated from ORU, and its board of trustees has included pro-Israel Christians such as pastors John Hagee and Kenneth Copeland and Bishop Keith Butler. But things may be changing at ORU. The current chair of ORU's board of trustees is the aforementioned Mart Green. He is reported to have "saved" ORU with a $70 million cash infusion. In January 2013, ORU's board of trustees elected Billy Wilson as the university's new president; a few months later, Wilson was named as a speaker for 2014 at the leading anti-Israel Christian conference, "Christ at the Checkpoint." Incredible conflict exists in the land of Jesus' birth/ I believe God mourns. The Barnes visit did not motivate further study ultimately yielding a more nuanced understanding. In October 2012, President Barnes hosted a "Hope for the Holy Land" evening at Bethel, a one-sided, blame-Israel speaking tour featuring Sami Awad, Lynn Hybels, and other long-standing Christian critics of Israel. 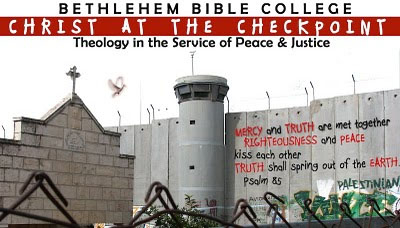 Since its founding in 1979, Bethlehem Bible College in the West Bank has been a leading source of the anti-Israel Christian narrative. In 2010, it launched a biennial conference called "Christ at the Checkpoint." The name of the conference along with a photo of the Israel security fence that forms its logo invoke the increasingly popular meme that Jesus was a Palestinian who would be suffering under Israeli occupation today much as he suffered under Roman occupation millennia ago. The days when one had to travel to Bethlehem to hear such anti-Israel voices are now over. The anti-Israel narrative of "Christ at the Checkpoint" is now being shared at major Christian conferences in the United States including those organized by Empowered21 and Catalyst. Empowered21, the preeminent gathering of Pentecostal/Charismatic Christians, provides a troubling example of this trend. Its leadership is a who's who of Pentecostal and Charismatic luminaries from around the world, including many longstanding friends of Israel. However, the leading critic of Israel among these leaders, Mart Green, appears to be playing an outsized role in setting the conference's agenda: Its 2012 conference in Virginia included a talk by Sami Awad and a screening of Green's film, Little Town of Bethlehem. Empowered21 has announced that it will hold its 2015 global congress in Jerusalem. Given the conference's connections to Sami Awad and Mart Green, there is some skepticism whether the choice of location was intended as a sign of solidarity with the Jewish state. Only time will tell if the organization's leadership will permit the conference to become a one-sided Israel bashing fest. In dozens of random conversations, I noted that Millenials … expressed solidarity with the Palestinians and annoyance with Israel. This is a seismic shift in the American church and a serious threat to Israel's one traditional area of support. A growing number of organizations are bringing an increasing number of Christian leaders, influencers, and students to visit "Israel/Palestine." These trips are well marketed and seek out mainstream evangelicals by claiming to be both pro-Israeli and pro-Palestinian—or simply "pro-people"—but never anti-Israel. Yet these trips tend to focus on Palestinian suffering and to blame Israel alone for this suffering. The Telos Group, founded in 2009 and funded by George Soros, is typical of these new organizations. Run by a savvy team professing a moderate agenda, Telos promotes itself as "a leading organization of America's emerging pro-Israeli, pro-Palestinian, pro-American, pro-peace movement." Their tours take visitors to both Israel and the Palestinian Authority where they meet with both Israelis and Palestinians. What could be more evenhanded? Yet these tours are carefully calibrated to teach their participants that Israeli policy is the source of Israeli and Arab suffering and the only real barrier to peace. The Palestinian speakers include extreme critics of Israel such as Mitri Raheb and Archbishop Elias Chacour (both featured prominently in The Stones Cry Out). The Israeli speakers, while not as extreme, are stalwarts of the far Left who likewise blame Israel for the region's problems. A brief visit with an Israeli right-winger—usually a settler—does more to confirm this one-sided narrative than challenge it. Telos organizes approximately fifteen of these trips every year. Another recent arrival on the scene is the Global Immersion Project. Founded in 2011, the project seeks to "cultivate everyday peacemakers through immersion in global conflict." But thus far, the only conflict they study is that between Israel and the Palestinians, and the only trips they make are to "Israel/Palestine." In 2014, they have two "learning labs" scheduled in the Holy Land. These newcomers have joined an old stalwart of the movement, the Holy Land Trust. Founded in 1998 by Palestinian Christian activist Sami Awad, the organization claims to promote nonviolent solutions to the conflict with Israel. However, Awad has stated quite clearly on his blog that nonviolence is "not a substitute for the armed struggle. This is not a method for normalization with the occupation. Our goal is to revive the popular resistance until every person is involved in dismantling the occupation." The Holy Land Trust promotes a strongly biased version of history in which Israel alone is to blame for the absence of peace. It shares this message to those who visit on their various service projects, olive harvesting initiative, and "Palestine Summer Encounter." Many rising young evangelical stars are bonding with Palestinians on their trips to the Holy Land. Questioning support for Israel and expressing sympathy with the Palestinians is fast becoming a hallmark of this group. They are dedicated to selling Christianity to a skeptical, younger generation by marketing it as cool, compassionate, and less overtly political. Most of the evangelicals who dominated Christian political activism for the past few decades—men such as Jerry Falwell, Pat Robertson, and Francis Schaeffer—were vocal supporters of Israel. While their children may share this perspective, they tend to talk about it less. In fact, Schaeffer's son Frank has become a vocal critic of "the largely unchallenged influence of Christian Zionism." This generational divide is best highlighted by the example of Christian publisher Steven Strang and his son Cameron. Steven Strang publishes Charisma, a leading evangelical monthly with a consistently pro-Israel perspective. He has also published works by many prominent Christian authors, including pro-Israel stalwart John Hagee. Strang was, until recently, regional director for Christians United for Israel. His son Cameron publishes Relevant, a highly popular magazine among millennial evangelicals, claiming to "reach about 2,300,000 twenty- and thirty something Christians a month" through its print and online publications. Less than a decade ago, Relevant was as pro-Israel as Charisma. In December 2005, for example, it published a powerful, pro-Israel piece called "Israel: Why You Should Care." In 2006, Relevant interviewed the author of this article for its weekly podcast, and the interview could not have been friendlier. Then Lynne Hybels took Cameron Strang to visit Israel and the Palestinian territories, and everything changed. During Israel's 2008-09 Operation Cast Lead in Gaza, Relevant published an article titled, "Is Israel Always Right?" in which the author dispensed with any balanced analysis of urban counterterror operations to conclude: "When I examine Israel's choices like I would that of any other nation, I find myself appalled that they're not doing more to protect the innocents [in Gaza]." When Israel confronted Hamas again in November 2012, Relevant published an article titled, "How Should Christians Respond to the Middle East Crisis" by Jon Huckins, a co-founder of the Global Immersion Project. The article was an extended exercise in moral relativism, noting the suffering on each side without attributing blame. Huckins never once criticized Hamas, but he did take a thinly veiled swipe at Christian Zionists by blasting the "hateful stereotyping, racism, and violent response [to events in Gaza] being disseminated by Christians." Freeze the frame today, and the pro-Israel side is still far ahead in the battle for the hearts and minds of America's evangelicals. Just one pro-Israel organization, Christians United for Israel, has over 1.6 million members, chapters on more than 120 college and university campuses, and sponsors thirty-five pro-Israel events across the country every month. Anti-Israel Christians do not come close to matching CUFI's size, activity, or influence. Those who reject such facile moral equivalence must take this threat seriously. They cannot let the evangelical community go the way of the mainstream Protestant leadership. They must not forget that big lies must be confronted early and often. And they dare not ignore the fact that Israel's enemies are telling very big lies to some very influential Christians—and telling them quite well. David Brog, executive director of Christians United for Israel, is the author of In Defense of Faith: The Judeo-Christian Idea and the Struggle for Humanity (Encounter, 2010). The term "anti-Israel" does not refer to merely criticizing Israel; almost every Israeli citizen does this on a daily basis. Its use here signifies recounting a one-sided version of history in which Israel alone is to blame for Palestinian suffering such as the repeated condemnation of Israeli security measures without a serious discussion of the violence that necessitates them. YWAM is a popular evangelical youth movement led by traditional, pro-Israel evangelicals. "About the Film," The Stones Cry Out website, film by Yasmine Perni, accessed Jan. 27, 2014. Graham Liddell, "New Documentary Challenges Evangelical Bonds with Israel," Ma'an News Agency (Bethlehem), Oct. 30, 2013. "Israeli Jews: The Impossible People at Christ at the Checkpoint," CAMERA, Boston, Apr. 11, 2012. "Reflections on Our Trip to Israel," Just Jay Blog, Bethel University, St. Paul, Minn., June 29, 2010. The terms "pentecostal" and "charismatic" refer to two growing and overlapping branches of the evangelical world characterized by animated worship, including speaking in tongues and other "gifts of the spirit" as well as a tendency toward biblical literalism. Jan Markell, "When Social Justice Equals No Justice," World Net Daily, Oct. 19, 2012. Presentation by Abraham's Children, First Presbyterian Church, Wheaton, Ill., Sept. 23, 2013. Alexander H. Joffe, "Bad Investment: The Philanthropy of George Soros and the Arab-Israeli Conflict," NGO Monitor, Jerusalem, May 2013, p. 50. "Our Story," Telos Group, Washington, D.C., accessed Jan. 27, 2014. McKay Coppins, "New Evangelical Movement Seeks Split from Pro-Israel Line," Buzzfeed, Jan. 14, 2014. "Curious what our Learning Labs are all about?" Global Immersion Project, Walnut Creek, Calif., Sept. 12, 2013. Sami Awad, "Nonviolent Resistance: Wake up every day and ask yourself what you can do to resist the occupation," Holy Land Trust, Bethlehem, Jan. 23, 2007. "Travel & Encounter," Holy Land Trust, Bethlehem, accessed Feb. 6, 2014. 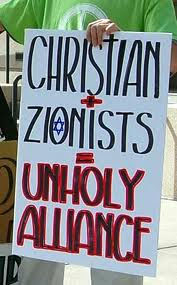 Frank Schaeffer, "With God on Our Side—Christian Zionism Exposed," The Huffington Post, Nov. 9, 2010. "The Relevant Story," Relevant (Winter Park, Fla.), accessed Jan. 27, 2014. Ed Gungor, "Is Israel Always Right?" Relevant, Jan. 20, 2009. Jon Huckins, "How Should Christians Respond to the Middle East Crisis," Relevant, Nov. 19, 2012. Donald Miller, "The Painful Truth about the Situation in Israel," Storyline Blog, Nov. 2012. Statistics compiled by Christians United for Israel, San Antonio, Feb. 2014. Related Topics: Arab-Israeli debate in the U.S., Israel & Zionism | David Brog | Spring 2014 MEQ receive the latest by email: subscribe to the free mef mailing list This text may be reposted or forwarded so long as it is presented as an integral whole with complete and accurate information provided about its author, date, place of publication, and original URL.